Fourteen new families registered with the ACDA*. These families are from the USA, France, Australia, Germany, Belgium, Sweden and Brazil. One lung transplant in Germany. One NORD research grant in the amount of $50,000. Fifteen rainbow babies born to ACDA registered families. One participant in the British Transplant Games 2018. Two additional tattoos of the ACDA logo. More than ten journal articles published about ACD. 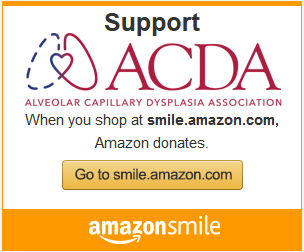 Numerous successful fundraisers for ACD research and awareness events. One continued goal – To find the cause of and cure for ACD. *This results in 244 confirmed or suspected ACD cases in 233 families registered with the ACDA as of December 2018. Please note this data is only with respect to families that have registered with the ACDA and DOES NOT include all reported or known cases of ACD. In addition, the known case reports almost certainly underestimates the true prevalence of ACD.